Who want a two by two kilometre and 100-meter open pit mine in their back yard or for that matter several square kilometres of land, plastered with 130-meter high windmills? Well the answer is simple nobody. Local communities together with special interest groups have been good at creating media stories on how the “little” man gets brushed aside by big business and sometimes with good reason. It could seem like that business in general and multinational companies especially have been struggling with getting on the same “wavelength” as the communities where they conduct their business. Industries like mining and big renewable energy projects are especially exposed as they involve heavy machinery, removal of vast amounts of dirt, dangerous working conditions, damage to the environment, destruction of nature and farmland. And a lot of the time all these activities translate into a massive impact on the social life of the surrounding population. So it is not strange that the locals finds it difficult to accept they should be subjected to this kind of influence. Factors like these are all well known and the companies involved have created a wide range of systems and tools in order to cope with both the positive and negative side effects of their activities. There have been mining in the world in the last 5000 years and its effect on society is well documented. Companies who are active in the industry knows that local communities are confronted with uncertainty as to what the future brings and have put in-place management systems and organised in order to confront these challenges. Sometimes these systems are to the benefit of the local population and sometimes not. 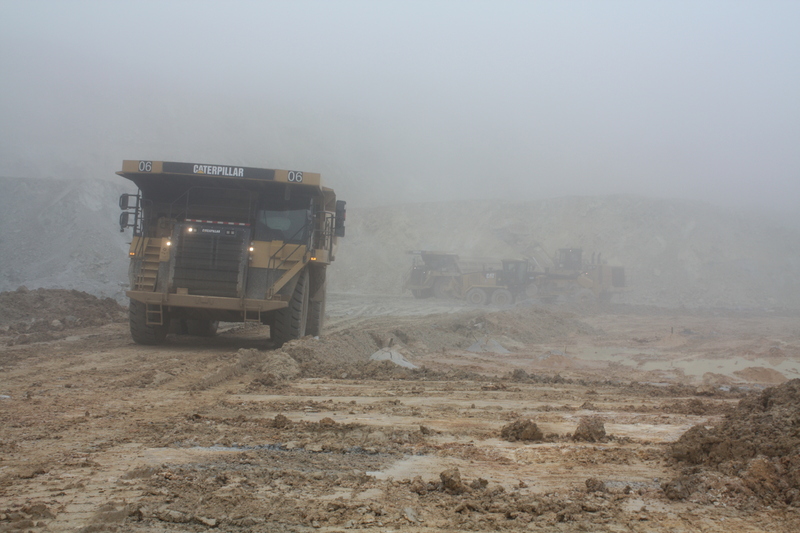 Even though social risks are well known and described in numerous cases it remains the principal reason why mining projects have to close down after start of operations. In practice this means that mining companies are left to experiment and relay on the knowledge they can get when things goes wrong, either in their own back yard or when one of their competitors get in trouble. However, we are now seeing companies in other industries being confronted by some of the same risks and having the same types of difficulties handling the risks that local communities present. Most people agree that the renewable energy sector by their very nature is working for a common global good. They help us reduce CO2-emissions, limit the impact of global warming, makes us free from the geopolitical implications associated with fossil fuels and creates a healthier local climate. However, they are also confronted by local communities who are not too keen on them setting up shop in their neighbourhood. These companies are making the very same mistakes that mining companies did that historically have resulted in closed down projects. For windmills and other great alternative energy infrastructure projects the story is repeating itself as we place windmills in areas where people complain about noise or that protected forests are destroyed in order to make room for some of the extremely huge mills that we are now able to produce. 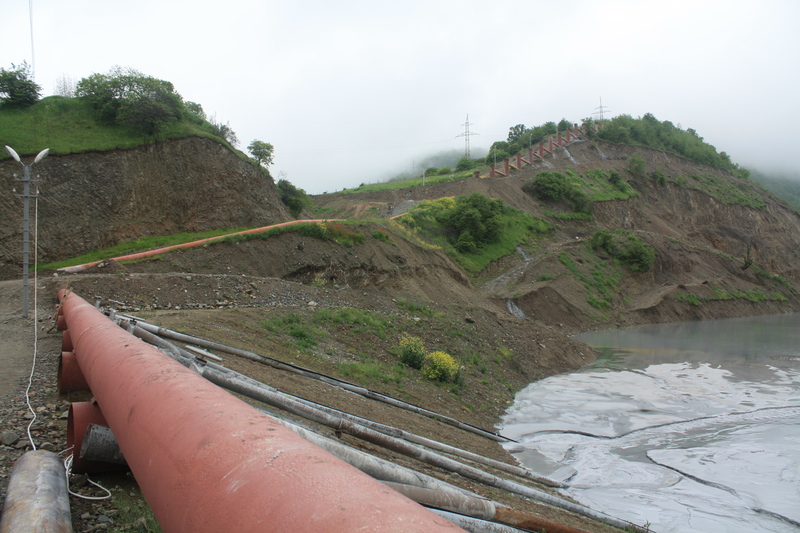 While we continue to argue about the pros and cons of alternative energy the fact remains that we do not want these structures where we live and we can muster significant resistance against projects which are perceived to be destroying local communities. The result has been that all major windmill projects in Denmark are now being moved to the sea despite the fact that this will drive maintenance costs up and make green energy more expensive. This development could ultimately mean that green energy will not be competitive with fossil fuel and in the end destroy the sector, as a real energy alternative. Companies faced with social risks have tried in different ways to mitigate issues with local communities. The most common approach that companies have taken when confronted with these types of risks is to implement a Corporate Social Responsibility (CSR) system that is designed to address stakeholder grievances in the local communities. These systems can take many and have different implications for the company that uses them. Evidence of this trend is clear if one takes a quick look at multinational companies and their websites where they routinely communicate they aren’t just in business to make a profit. A lot of companies actually goes as far as to communicate that their goals are equally focused on servicing the communities for a broader and bigger social purpose. It has been shown that CSR has been an effective way for companies to show that they are good corporate citizen with a conscience. And has been a way for them to communicate and convince local communities, nongovernmental and governmental organisations that they are working for a common good that will serve social, environmental and economic aims. However, fieldwork shows that local communities might not be too keen on the sometime very fluffy speeches given by corporate executives. These communities do not only get their information from the company when trying to make sense of a proposed project but get insights from a wide variety of sources ranging from other community members to NGOs and government officials. This means that while the CSR systems might look good on paper they often miss the point that they are not the only way that communities get information and create an opinion about a given project. And by interviewing community members it actually shows that CSR systems are giving rise to even more risk as they provide ammunition in instances where companies say one thing but do another. Like for example when companies communicate a zero environmental impact on water sources but communities experience mud in their drinking water. Or when companies document that their windmills make no noise but people living close by creates headlines when telling the press about their sickness history. While research into social risk is still in an early stage it shows that companies have little control over how stakeholders sense making processes surrounding the projects that they propose. It also shows that CSR might not be the “miracle cure” that most of us would like it to be and could actually be counterproductive to the aims of the company and society at large. So called normal people will continue to make their own mind up around the world that they are part of and they will continue to change their mind when and if they get smarter. Even though companies would like to think that they can influence their surroundings by claiming that certain things are true such as green energy and windmill projects are for the good of everyone, it does not make the individuals affected by such project think that this is necessary true in their local community. I have just participated in the EHEF (European Higher Education Fair) in Indonesia where we presented graduate and undergraduate programs in Samarkand and Jakarta. It has been a hectic week with around 15’000 participating students and over 100 European universities and higher education institutions as well as representatives from embassies and the EU. The success of the fair and the eager questions form the students reaffirm my belief in education as a key indication for how Indonesia is rapidly moving ahead. With a GDP growth of 6,2% a drop in poverty and school enrolment exceeding 100% spurred by more and more overage students enrol in primary school. Indonesians have their eyes firmly targeted at education. In the years to come I believe that Indonesia will benefit enormously from the education strategy in several key areas. First, today Indonesia is a multicultural and multi-religious society blending its own unique history with Muslim, Christian, Hindu, Buddhist and many other religions together. However, as seen elsewhere economic development also have the backside of creating social tensions as some embrace and utilise the opportunities fully, while others feel left behind. What education can help with in this process is to ease the social tensions by providing a more even playing field (or at least as close to as possible) for young people who have talent. While there are differences in access to the best schools and especially for students access to education in Europe and the US it is significant it’s a significant contributor to mitigate the risk of social tensions. Secondly, it will bring Indonesians in contact with the world in another way than business can. Through the social interaction between students from the countries they travel to and other international students networks are created which will benefit not only themselves, but also ensue long term social and economic sustainability as students become business and government professionals and need contacts that they trust around the world. Thirdly, It brings knowledge to Indonesia, which is much needed in the years to come if the growth is to be supported and managed. One of the threats that the country is facing is that huge bubbles are created in the economy being in housing or specific sectors. Just taking a look from my one window at the hotel reveals five skyscrapers being build so it is definitely a risk that one have to take serious. And while bubbles is a natural part of a capitalist economy the impact can be cushioned though a economy which is build one more sectors and have more players. As students take business ideas back with them they create new businesses and thereby diversify the economy bringing a valued stabiliser into the equation. While there are critical voices around the growing internationalisation of undergraduate and graduate education, as it is seen to some as a business rather than an “exchange” of ideas. It think that the benefits significantly and especially long-term far outweighs the downsides. Corruption can defined as “the misuse of entrusted power for personal benefit”. It can also be described as letting personal or family relationships influence economic decision making, be it by private economic agents or by government officials. Corruption is always kept more or less secret and therefore is the individual behavior of corrupt agents almost impossible to observe systematically in real life. You know it when you are subjected to it. The objectives of government are vital to the understanding of the diverse negative effects of corruption on the public service. Corruption renders governments unable or unwilling to maximize the welfare of the public for personal or the gains of a small group of people. A corrupt principal creates allocation inefficiencies and cripples its credible commitment to effective policies, and opens the door to opportunism. Because corruption must be hidden from the public and is not enforced by courts it entails transaction costs, which are larger than those from legal exchange. This suggests that corrupt contracts are primarily relational contracts where legal exchange serves as a basis for sealing and enforcing corrupt agreements. Legal exchange not only provides for corrupt opportunities, but for the necessary enforcement mechanisms. Examples of such legal exchange are long-term business exchange, belonging to the same firm or political party or being embedded in social relationships. The latter may even comprise the engagement in charitable institutions. Reform should not only focus on limiting opportunities for corrupt behaviour but also on impeding the enforcement of corrupt agreements. According to transparenecy International there are two types of corruption that one can encounter “According to the rule”- and “Against the rule”-Corruption. “According to the rule” constitutes a situation where an individual receives an illegal payment for something he/she is required to do by law – for example when a state official solicit bribes from a company for expediting a routine public service. “Against the rule” refers to a situation where a bribe is paid to obtain a service that the receiver is not authorised to provide but gains access to through a bribe. For example skipping the queue to gain access to a prestigious school or gaining a permit for which would normally would not be granted. Both of which are deemed as counterproductive to positive social and economic development. There is no way to know how widespread corruption really is and the level of impact on financial and social development. 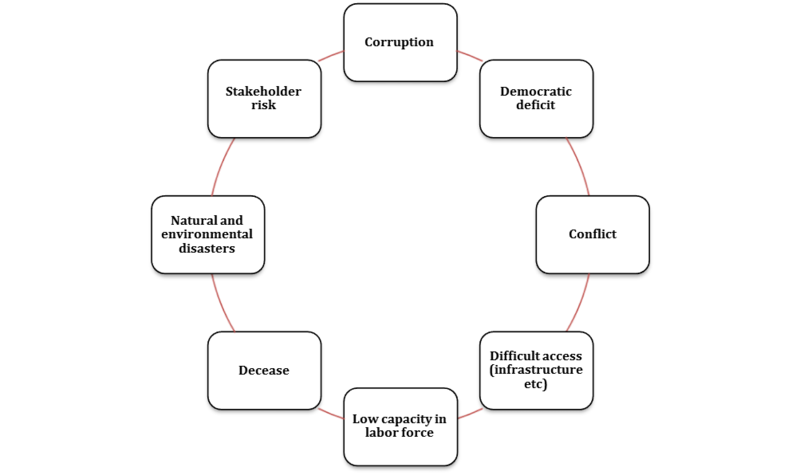 As a Social Risk corruption is properly one of the first things that organisations investigate when investigating possible investments in a region or country primarily because there is a direct link between the perceived level of corrupt behaviour and general social issues like crime, rule of law, healthcare, etc. When evaluating social risk in a region Transparency International, EBRD, OECD, IMF and the UN good sources for your assessment pared with local sources such as trade groups, the embassy in the region, government business development initiatives, etc. Bishop, T.J. and Hydoski, F.E. (2009), Corporate Resiliency: Man- aging the Growing Risk of Fraud and Corruption. Hoboken, NJ: John Wiley & Sons, 51–208. Uslaner, E.M. (2008), Corruption, Inequality, and the Rule of Law: The Bulging Pocket Makes the Easy Life. New York: Cambridge University Press, 30–249. Svensson, J. (2005), “Eight Questions about Corruption,” Journal of Economic Perspectives 19(3): 19–42. Weitzel, U. and Berns, S. (2006), “Cross-border Takeovers, Corrup- tion, and Related Aspects of Governance,” Journal of International Business Studies 37: 786–806. Luo, Y. (2006), “Political Behavior, Social Responsibility, and Perceived Corruption: A Structuration Perspective,” Journal of International Business Studies 37, 747–766. Cuervo-Cazurra, A. 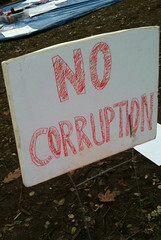 (2006), “Who Cares about Corruption?” Journal of International Business Studies 37: 807–822. Jensen, N. et al. (2010), “Understanding Corruption and Firm Responses in Cross-national Firm-level Surveys,” Journal of International Business Studies 41: 1481–1504. Most people would think that countries like Spain, Greece and Portugal would rank among the very top of countries for tax evasion schemes. But even though the US has a relative low tax rate the country tops the list of places where tax evasion seems to be part of corporate culture. 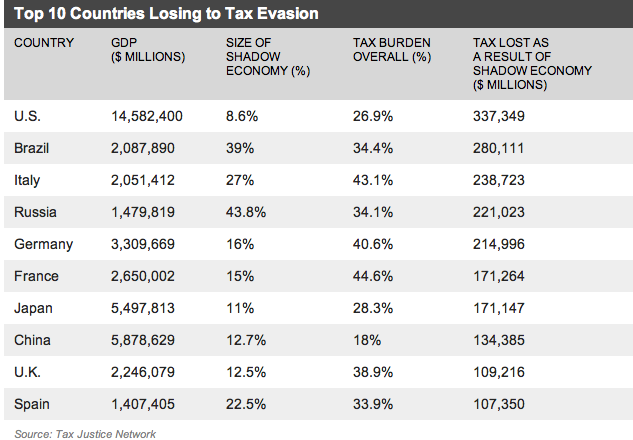 So how big a problem is tax evasion? Take a look at the table below from Tax Justice Network, a London-based watchdog that fights against tax havens and for more transparency. America’s “black” or “shadow economy,” represents 8.6% of GDP, while the percentage is by far the smallest of any of the countries on the list it does represent a significant monetary post and represent roughly the GDP of Denmark the 32 biggest economy in the world according to the IMF. How does the companies in the US manage to avoid tax? Well, one suggestion is that companies like Google, Apple and Amazon manage to cut their tax bill by one third through a series of moves that involves countries in Europe and in the Carrabin, a system is also used by big European companies to transfer funds to tax havens. My friend Sarah Wenger has created the infograph titled “The master of Tax Evasion” that explains how the system works. There is no doubt that companies are faced a level of scrutiny that the world have never seen before. Almost on a daily basis are companies being exposed as fraudsters, environmental culprits, tax evaders or child labour abusers. No company can know what or who will be next to be exposed in the media as the biggest unethical corporate abuser of the worlds resources. One side effect of this trend have been the numerous standards and quality management systems that focuses on different approaches to reducing the risk of poor decision making and unethical corporate behaviour. There is no doubt that companies need a systematic approach in order to keep their managers and decision makers on a leach. However, there are limits to how comprehensive a given system can be and still be relative effective. Just think of the Sarbanes-Oxley or BASEL 2 frameworks, which did little to prevent the biggest financial downturn with an epicentre in the very industry that they were put in place to regulate. As I see it is traditional risk management programs such as the above mentioned narrowly focused on operational and compliance risks and consist of short-term point solutions. Which are narrowed down to mitigation actions specific to particular sources or impacts of risk. But what happens when risks are rising from multiple sources and places within all the corporate entities? Point solutions can work well for pinpointed risk areas, where the main objective of the risk management effort is to avoid or prepare for a particular event and in so doing reduce the associated cost. However, focusing on one point or case cannot work for strategic risks, where complex origins demand an integrated management approach across entities, borders and levels of authority. One dimension of social risk’s complexity is that it is often a function of strategic or operational decisions companies have made that affect issues that stakeholders care about. So instead of being a “one system fits all”-approach it encompass a wide range of areas which overlap and are integrated into each others systems in order to create a fine masked network which enables organisations to catch issues as they arise and before they become a crisis. In the coming weeks and months I will try to explore the different parts of the Social Risk wheel that I have developed in order to better understand the organisational impact these individual elements might have on the positive developments of corporations in a global context. The crisis in Vestas is now so deep that the group existing only because of their banks want the too. According to a local Danish newspaper Jyllandsposten has Vestas has signed an agreement with banks to ensure that the company has enough money to continue operations. Otherwise they would have to close down operation. The information has been disclosed in an interim financial statement for the second quarter of 2012.Which follows several years of poor financial performance and inability to change its strategy when the financial crisis hit in 2008. The situation is now that Vestas has been unable to live up to the loan agreements made with its bank connections a significant step down from just a few years ago when the company was one of the fastest growing companies in Denmark. “Despite this, financial covenants testing is affected by the disappointing results realised by Vestas in the second half year of 2011 and the first quarter of 2012, which mainly related to the cost overruns in relation to the introduction of new technology” says the statement from Vestas to add: “Vestas has therefore agreed with its lenders to defer the half-year 2012 testing of the financial covenants contained in Vestas’ banking facilities and the lenders have allowed drawings, which in the opinion of Vestas are sufficient for the continued operation of Vestas on usual terms since the company expects to test on normal terms in the future. “The fact that banks are easing the requirements shows that the Vestas simply can not live up to them. There is only one explanation, and it is that they do not get the money in the Treasury, as required,” said Frank Jensen epn.dk. This should be seen in the light that Vestas lost 338 million. 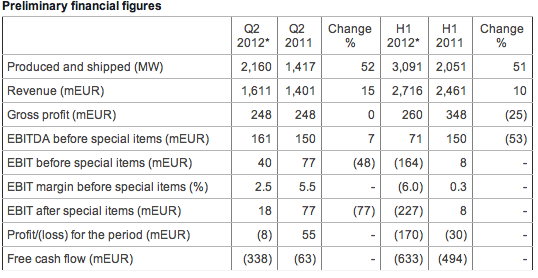 euro in the first quarter and during the first two quarters the total is now nearing a total of 633 million euros. Revenue increased to 1.6 million. Euro. and is increase from 931 million. euros from the same quarter last year. However, the increased revenue is not impressive in the light that it bottom line showed a deficit of 8 million. euros after tax, compared with a profit of 55 million. euro in the second quarter of 2011. Vestas considers this to be a temporary issue and in the light of the company’s positive results in the second quarter of 2012 combined with the large backlog of firm and unconditional orders, Vestas expects to meet the financial covenants contained in its current banking facilities in the near-term future. With this in mind it becomes increasingly difficult to believe that Vestas will be able to live up to its financial commitment even after massive layoffs and changes on board level. After years of two digit growth figures in China the economy is about to slow a bit down for what IMF believes will be a soft landing. The main drive for this change is the situation in Europe, which does not seem to improve anytime soon. However, the domestic Chinese market seems to be a driver.